On or around this date — exactly when is forever obscure* — the former Tour de France cyclist Julien Vervaecke was summarily executed by Polish and British soldiers in German-occupied Belgium. 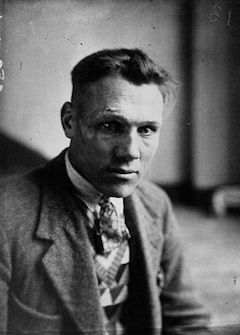 The Belgian velocipeddler raced professionally from 1924 to 1936 and reached the top ten of cycling’s signature event four times — capped by a third-place ride in 1927. By the time war clouds had gathered anew, Vervaecke (English Wikipedia entry | German | French) had retired to proprietorship of a restaurant in Menen, on the French border. As the Wehrmacht blitz overran Belgium, Vervaecke’s home chanced to fall within the British pocket pinned to Dunkirk, 70 kilometers away away. The famous evacuation would commence on May 26. On May 24, scrambling soldiers of the British Expeditionary Force, apparently including some officers of the exiled Polish army,* tried to ransack Vervaecke’s place for supplies, and the ex-cyclist resisted. As with Marechal all those years ago, Vervaecke had the worst of this collision, and the tetchy troopers led him away. Nobody witnessed what happened to him; his body only turned up weeks later, over the border in France. It’s guessed that he might have been detained and then shot out of hand hours later — more prey to the fog of war. 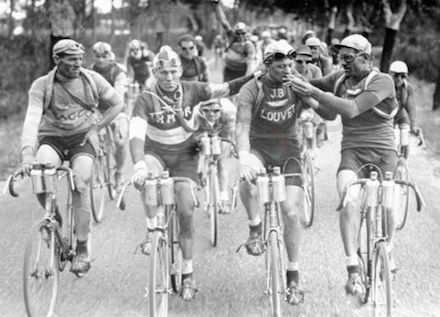 At least he didn’t die of lung cancer: In a different era for athletics, Vervaecke and Maurice Geldhof take a trip to flavor country during the Tour de France. * Poland had already been occupied by Germany and the USSR, in September 1939.